For seven years in a row, Roth Cheese’s GranQueso has been a big winner on the national and international award show circuit. Seven! There is so much going on with this orangey-red on the outside, amber on the inside cheese that is inspired by Spanish manchego. 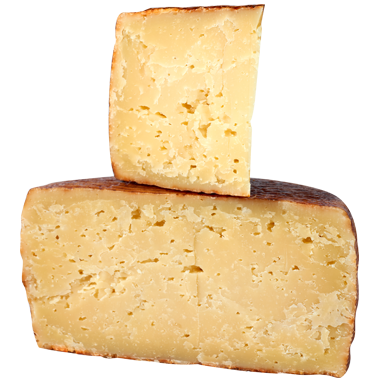 GranQueso wheels are hand-rubbed in a blend of cinnamon and paprika, and textured in a beautiful basket-weave rind, making them a real eye-catcher on a board or spread. If the question is, would we like another serving of lively and bright, manchego-style GranQueso, our answer will always yes, please! Grate it, slice it, melt it or crumble it. Serve at or near room temperature. Use a sharp knife because the rind can offer some mild resistance. Spanish and Portuguese sippers go well with GranQueso, of course, so rioja, vinho verde and albariño are all lovely. Sangria too. Really though, any brightly acidic and still-to-bubbly white or light and fruity red loves this cheese. Stronger spirits that dance well with GranQueso (no toe-stepping!) include sherries, ports, madeira, fruit liqueurs and high-quality tequilas. Lighter lagers like pilsner will do the trick too. We almost always save this beautiful, showy cheese for our cheese boards because it’s such a conversation starter. It goes well with everything from marcona almonds, castelvetrano olives, roasted red peppers, honey and membrillo, to jamon or whatever other cured meats you have on hand. If you want to cook with it, we recommend grating it into a veggie casserole (it melts really well), or thinly slicing it into a bright green salad.